Traffic was sparse on the interstate last Saturday. The sun was only halfway up and my son rode shotgun, strumming his ukulele. We were making good time. My heart raced. “You know, son, I may just sit this one out,” I murmured, half under my breath. “What? No dad, you can’t. 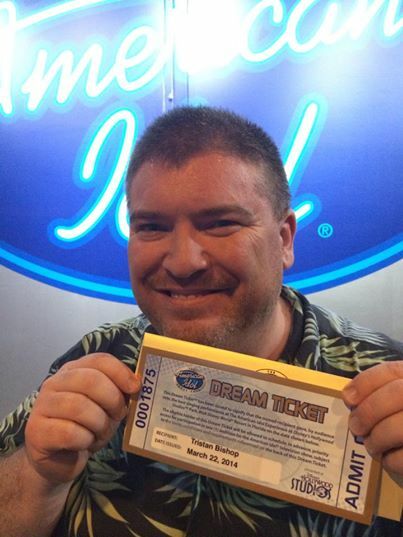 This may be our last chance to audition for the American Idol Experience. Don’t you want to do this together? “I guess I’m just feeling too old and too plus-sized to be stared at. I tried to will the tear drops toward the driver’s side of my face. What if you ignored your insecurity for one day? What if you tried something you’ve always wanted to try? What if you considered the odds and braved them anyway? Perhaps you already know exactly how you are gifted? And yet, when you muster the gumption to open your gift, you suddenly hear every unkind word ever spoken to you? If you stiff-armed self-doubt for one day, what would happen to you? We arrived at Disney’s Hollywood Studios just as they opened the gates. Weaving through the crowd, we made a brisk beeline to the 1,000-seat theatre where they audition and perform the American Idol Experience. Each day, hundreds of Disney World guests audition for the chance to be one of the day’s 15 performers. My son and I went in together and cleared the first round. Next, we went into a private audition with the producer. After 15 minutes and 4 songs, he let us both in the show. My son was to compete in the 2:15 PM semi-final and I was added to the 5:00 PM show. There I was, backstage with these four brave kids. My son was content and confident. (I’m so grateful that he’s grown up to be self-assured.) But the three other finalists looked much less secure. I felt for them. (I felt like them.) So, just before the curtain, I silently prayed that whichever kid needed it most would receive the most audience votes. I prayed for the Dream Ticket to land in the hands of the kid most in need of a victory. Sometimes, the kid who needs the victory most is you. Don’t let your doubt drown out your gift. I got my Dream Ticket. It’s two published novels with a third one coming out in August. What does the dream ticket win you? Tristan, CONGRATULATIONS!!!! Thank you for sharing your behind the scenes with us!!! So many of in the leadership space have admired your leadership and your heart for so long. You are such a beautiful example of character, courage, kindness, and leadership! This fan will be cheering for you from across the world! So kind of you, Chery! I truly appreciate your encouragement. I’m at my desk at MindTouch HQ reading this and trying not to cry. You’re awesome dude. Thank you, Aaron. A bit of that crying thing was involved on this end. Goes with the turf, fatherhood and all that. I appreciate your encouragement! Wow, great story. Congratulations! And thanks for the reminder to all of us. Thank you so much, Lynette! I appreciate your encouragement and am grateful for your kind words. Thank you, Mike! I am grateful for your encouragement and glad the post was meaningful. You’re very welcome. So glad to her that, Jarvis. “Sometimes, the kid who needs the victory most is you.” Felt that man. Congratulations for your dream ticket. You really got some nice bonding with your son. The conversation just resonated in me. I myself would think that I’m too old for such things but you really did a good job here Tristan. “Don’t let your doubt drown out your gift.” I’ll take chance! of reading this weblog’s post to be updated regularly. I’m seeing a great father and son tandem here! Great slice of life! appears a lot of it is popping it up all over the internet without my permission. Do you know any ways to help reduce content from being ripped off? Thanks for following me! Love this story…I can only follow 2k on twitter 😦 plebe status. Have a Wonderful Christmas and new year!